Around the time of Good Beer Week 2015, there were a lot of international brewers flying in and out of the country and, while here, many of them took the opportunity to visit a local brewery or three to collaborate on a beer. One of those was a legend of the US scene in Bill Covaleski of Pennsylvania’s Victory, who spent some time at Nomad’s Brookvale brewery. What he had a hand in creating is a sort-of sequel to the Prima Pils, Victory’s very highly regarded take on a classic pilsner. Called Secunda – how could it be anything else – this beer takes much of the magic of Prima and gives it some real local flavour by way of using all-Australian hops. 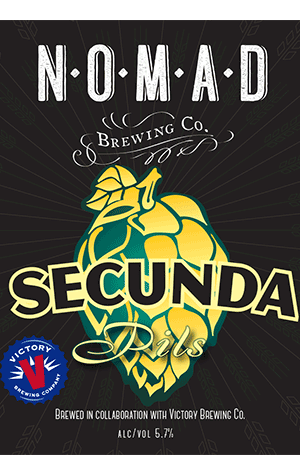 As with the Prima (and indeed all of Victory’s beers), it uses whole hop flowers, rather than the usual hop pellet, and that’s not something for which the Nomad brewery is necessarily designed to handle. After much clogging of equipment and, apparently, swearing, the beer came out and it came out very nicely indeed. It’s certainly on the hoppier side of pilsners, perhaps making it an interpretation well suited to today’s hop-seeking craft beer drinker. There’s a herbal character and a decent whack of bitterness but the slightly sweet and bready malt character still comes through. Like a good pilsner should be, Secunda is very clean and clear and just feels lovely to drink. The flavours really linger long and, coupled with some dryness, has you hanging out for another one.